There is a theory that says if you give typewriters to one hundred monkeys, and let them type for one hundred years, they will eventually reproduce the works of Shakespeare. We decided to put that theory to the test – with a few minor modifications. 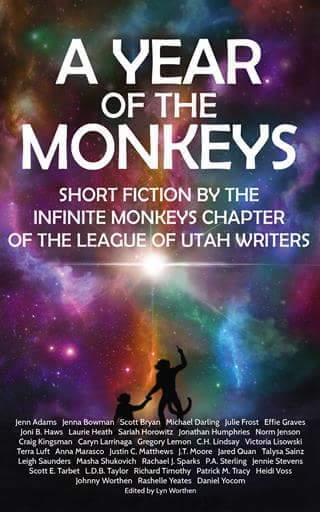 We didn’t have one hundred monkeys – but we did have the membership of a League of Utah Writers chapter that calls itself “The Infinite Monkeys.” Most of them didn’t have typewriters, but worked on laptop or desktop computers, smartphones, and tablets. And instead of one hundred years to perfect their prose, we gave them one year to get from blank page to published anthology. So while you won’t find any reproductions of Shakespeare here, what you will find are thirty-five short stories that will make you laugh, make you cry, make you think, and sometimes make you glad you don’t live in the unsettling worlds of the imagination.